The other day, I was talking about Touch! Generations. Oh...do you know what Touch! Generations is? Like Dr Kawashima’s Brain Training24 and English Training: Have Fun Improving Your Skills!25 24Dr Kawashima’s Brain Training: How Old is Your Brain? : A game released in South Africa for the Nintendo DS system in February 2008. 25English Training: Have Fun Improving Your Skills! : A game released in Europe (but not in the UK and Ireland or South Africa) for the Nintendo DS system in October 2006. Nintendogs belongs to that category as well. As a new challenge, we grouped together several titles that children, their parents and grandparents - three generations - could play together regardless of their knowledge and experience of video games. And we labelled that group Touch! Generations. We started it up as a brand that people playing video games for the first time could buy without worrying, and it led to rather positive result for Nintendo DS. So with regard to how to handle Touch! Generations for Nintendo 3DS, we had some discussions among ourselves. But when you think about it, Nintendo DS came out as a game system unlike any before, and we gave Touch! Generations its name to suggest that even people who don’t usually play video games could play those games without fretting. When considering the basic element of playing games by touching the screen with the stylus, we thought there might not be much point to making another Touch! Generations for Nintendo 3DS, which would just be an extension of Nintendo DS. When we thought about what kinds of activities a new player who doesn’t know much about games could enjoy on a Nintendo 3DS, what came to mind was taking 3D photos, watching 3D videos, things like that. In other words, functions in the system itself. You could say that the system itself fulfils the role of Touch! Generations. Of course, demand will continue for those Touch! Generations games that buoyed Nintendo DS, so we will continue to make them. But we decided that, whereas before we had established a Touch! Generations brand, created special corners in shops and used a special logo, the company has decided not to use this brand name for Nintendo 3DS. We won’t use Touch! Generations in the future. Oh, really? Even the sales people? I thought that was incredible. I try to not use the word “success” to describe our situation as it may stir egoistic emotions which may lead us to be drowned in it. I would say that Touch! Generations was one example of success. But to do the same thing is merely playing defense. Deciding that we wouldn’t use that name again would allow everyone to tackle their work anew. There’s a feeling that this hardware itself is Touch! Generations. Something else you can say is that it’s no longer surprising to talk about older people playing video games. People with no video game experience now have a way to get started, so game systems now belong to everyone regardless of age, gender or experience. I think the time for making such distinctions by using such a word has ended. That’s right. Thinking within that framework no longer pertains. You can say that about game makers, too. For example, when it came to Touch! 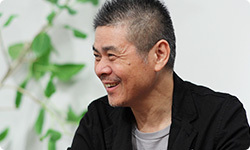 Generations, while it was a series different from previous games, the same development teams were making the software. But when it comes to, say, editing 3D videos for Nintendo 3DS that we are planning to distribute using SpotPass, that’s all being produced by teams outside of development. So makers have to make changes, too. If you assume that those who have made the games so far are the only ones to make anything, the chances of making new software are ruined right at the start. To return to what we were discussing before, I think it would be interesting if companies other than Nintendo were more involved with Nintendo 3DS. For instance, I think it would be fun if movie directors seriously made 3D movies for it. Along with that comes the question of how players will make use of it. That’s really something to look forward to. Nintendo actually has a lot of projects underway that call on players’ creativity. Like Flipnote Studio26 and Make It Yourself: Nintendo DS Guide.27 We disseminate these materials in the hope that players’ creations will draw in others and lead to greater enjoyment for all. It would be great if that led to big changes and revealed a new pillar of entertainment. 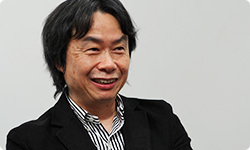 Miyamoto-san, you think there’s something there, don’t you? 26Flipnote Studio: A free Nintendo DSiWare application released in Europe in August 2009. It allows users to create hand-drawn images with the stylus. Users can play multiple pages successively, resulting in flipbook animation. 27Make It Yourself: Nintendo DS Guide: A free Nintendo DSiWare application released in Japan in November 2010. It allows users to create guide services by assembling photographs and sound clips taken with a Nintendo DSi or Nintendo DSi XL. This title has not been released outside of Japan at the time of this interview. Ideally, you nail down the base enjoyment and don’t allow anyone to get a word in, so that no matter what the players say, you don’t budge, but then, after release, you say, “Now do whatever you want with it.” I suppose that balance is good. What’s similar, but no good, is muddling what you need to set right at the start. When you make something in constant worry over what everyone thinks, you never solidify that basic element for players to enjoy. In that way, I’m really looking forward to Nintendo 3DS. Yes. I’m not really sure what will happen - how the world will take it, how it will catch on - when this system, which provides such peculiar enjoyment, suddenly falls into players’ hands. But that uncertainty is exciting!